Schoolgirl baby-sitters Rita and Sue long to leave their dull world and so take their charges' father, Bob, up on an offer which develops into a three-way affair. Never mind that Bob is married to Michelle; to the girls he represents excitement, adventure and a brighter future away from their unhappy home lives. But, of course, life is never so simple. Andrea Dunbar's play, written whilst still a teenager, re-emerges in a timely revival within a world all-too-similar to the one in which Dunbar birthed it; social divisions and mobility, redundant aspirations and the sexual politics between men and women are as pertinent now as they were in the Thatcher era when "Rita, Sue and Bob Too" first premiered. This co-production between Out Of Joint, Octagon Theatre Bolton and The Royal Court Theatre is an elaboration of Dunbar's world that is reflected in her non-judgmental, frank yet witty writing. That it is not too far removed from current issues is a boon and the play also essays the positives of resilience, reconciliation and the fragile bonds of friendship in unconventional circumstances. In reality fairy-tale happy endings are absurdly rare and Dunbar is unafraid to ponder this fact in her story. Director Kate Wasserberg's lithe, uncluttered staging allows a forthright presentation, furthered by Tim Shortall's design, where the humour and pathos of the text (newly edited by John Hollingworth) is brought to vivid life in splendid performances from a cast led by Taj Atwal, Gemma Dobson and James Atherton as the titular characters. Samantha Robinson, Sally Bankes and David Walker make up the remainder of a company who each venture delicately balanced interpretations whilst avoiding sentiment and pity. Without exception the cast excel and all are eminently watchable. 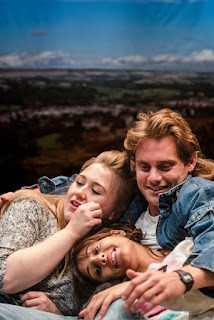 Played without an interval (and running less than 90 minutes) "Rita, Sue and Bob Too" is a stark yet amusing enterprise presenting a life scarcely seen - and oft ignored - that speaks eloquently - even in its crudeness - to a contemporary society with all-too-familiar issues. Happy endings are relative and Dunbar reminds us of that. Rita, Sue and Bob Too is at the Citizens Theatre until 17th February. For tickets and information visit their website.